Now anyone can pop-up a stunning backdrop to create the ideal ambiance for party selfies, and corporate, church or school events in only a few minutes without busting the budget. The solution everyone has been looking for in a portable backdrop was introduced by Hollywood-Based Grosh Backdrops & Drapery – Pop-Up Drop. It’s an eight-feet tall by 10-feet wide light-weight frame and backdrop graphic of your choosing that simply “pops-up” and snaps together in about five minutes. No tools required. Most people know Grosh Backdrops & Drapery for its much larger stage and theater backdrops. 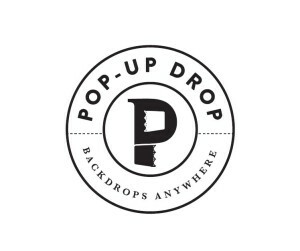 The new Pop-Up Drop, however, is for folks who need a compact backdrop. The party or event planner can choose from any of the more than 50 backdrop designs on Grosh’s website. Or a custom backdrop instead can be purchased at an additional cost. If, however, Grosh decides other customers would like to use your custom design, it would be made at the regular rental charge of $295 for one week. Assembly is literally a snap. The Pop-Up Drop kit is shipped to the customer in a hard shell case which includes the frame with an attached backdrop graphic. The customer removes everything from the case. 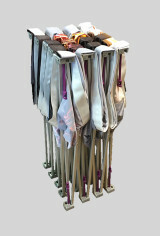 Then, they simply stretch out the frame and snap together 18 purple arms along the frame’s perimeter. Then, pull the backdrop flaps over the side and attach the Velcro tabs. Next, stand up the frame and snap together six more support arms in the middle of the frame. The last task is to slide in two stabilizing foot bars on each end of the frame’s base. It’s that easy – really! In an instructional video available for viewing on the Grosh website, assembly takes approximately three minutes. But if one carefully reads the six-steps of instructions, which only take up half a page, it’ll likely take the first-timer five minutes. 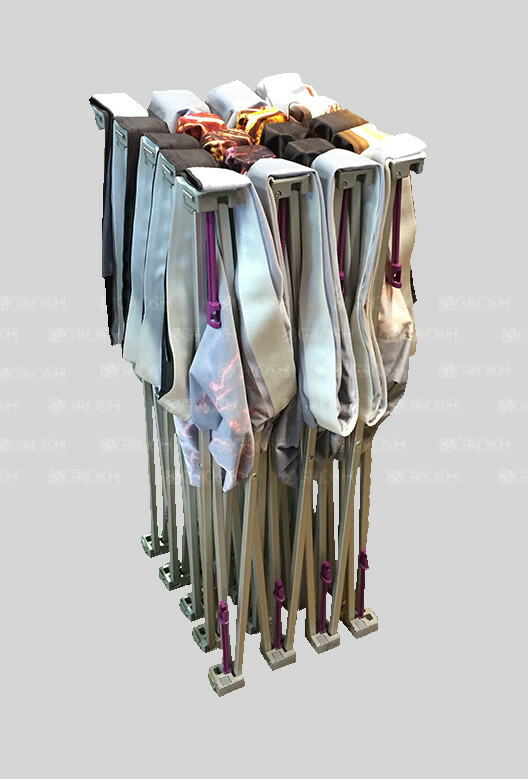 If needed, there is also a larger Pop-Up Drop which measures eight-feet tall by 20-feet wide for $495 for one week. 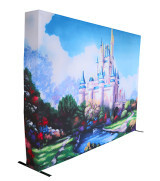 Other smaller backdrops typically require hanging from a pipe frame which is usually assembled by a professional crew. So, the customer will likely end up spending more than they would for the quick and easy Pop-Up Drop, Smith said. She adds planners of any indoor event, whether it’s a corporate presentation or a birthday party, will find endless uses for the Pop-Up Drop. And in this age of instant messaging and selfies, it’s a great item for the world of Instagram, she said. Ordering is simple. If the backdrop is in stock, it can be shipped out the next day or even the same day if the order is placed first thing in the morning. If the backdrop of choice is not in stock, then Grosh requires 10-15 business days to ship. A non-refundable deposit is required. The additional cost of shipping is usually less than $50 roundtrip from either of Grosh’s warehouses in Los Angeles, California or Evansville, Indiana. Grosh Backdrops & Drapery is among Hollywood’s longest supporting partners. 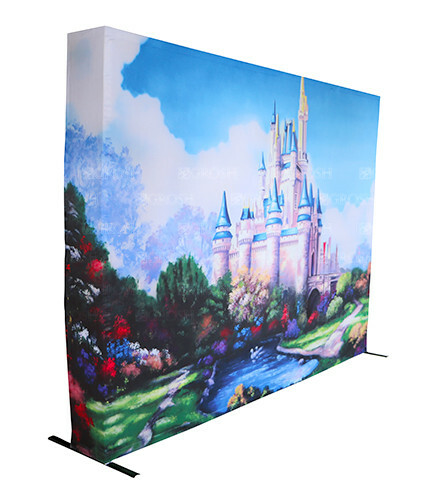 Grosh provides the highest quality themed and theatrically produced hand-painted backdrops for professional stage productions, dance recitals, school performances or corporate parties. Grosh also offers an excellent drapery selection including rain curtains, Austrian puffs and velour drapery panels. You can visit www.GROSH.com to see the full line of products and services.